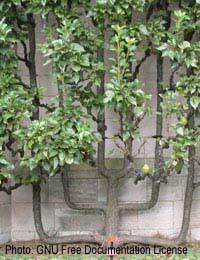 Home > Ask Our Experts > Espalier Pear Tree Losing Fruit: What is the Cause? I have an espallier pear tree that I planted two years ago, it was about 1.5 metres high when planted and is growing quite well. I noticed last year however, that the young/ small fruit was being knocked off on to the ground (early June). This year the same began happening when the fruit was forming so I covered it with bird netting and it seems to have got worse? Any ideas? It isn’t clear from your question whether you bought the tree ready-trained from a nursery or whether you planted it with the intention of training it yourself, but it sounds like a young tree that needs to be established before it can flourish and produce good crops. We’ll talk about that in a minute but first let’s consider what could be happening. You say the fruit is being knocked off. Have you examined the stalks carefully for signs of rot or disease or insect attack? You may need to take a magnifying glass to check closely. If you’ve eliminated those possibilities and provided protection against birds, is it possible for hungry vermin to get under the netting? However if the fruit that has fallen to the ground doesn’t show signs of having been eaten, we have to wonder if it could be a growing problem in this instance i.e. that the fruit isn’t getting the essentials for survival. A young tree will take several years to be established and trained. Proper and regular pruning is vital, not just to produce the shape of espalier you want but to ensure a strong and healthy tree. If you encourage the tree to grow upwards too quickly, the lower branches will suffer. Branches growing upwards will more easily take nutrients and thus deprive the branches being trained to grow sideways, so timing in the pruning and training is of great importance. Ideally the final diameter of the bottom branch should be twice that of the top branch and in that way healthy fruit will grow and survive at all levels. Care taken in the first few years will be rewarded with a long-living, fruitful and attractive tree. For good fruit production a regular dose of sunlight is important, as is well-drained soil. The tree should be watered especially during dry periods and fed an appropriate food – follow the manufacturer’s instructions. It is also important to keep the area under the espalier tree free from weeds especially grasses. It can take up to five years for an espalier tree be established, to reach its final height and to be produce a good crop of pears. i have a pear tree thatcame up threw the center of my old pear tree. the old tree was approx. 8o yrs. old and was struck by lightning some years ago .the old was bearing fruit every yr. then it hollowed out and this sprout came out of the center of it .the sprout is about 10 ft. high now.it has small rusty pears every year, but they are only about the size of a quarter and very rusty. I have a concord and a conference pear tree, every year some of the young fruit get affected by some sort of insect boring into some of the fruit, I have seen ants on the trees, could this be the cause of some fruit loss ? I have 5 in 1 pears 6 years old they only produce a teensy round pears what am I doing wrong?